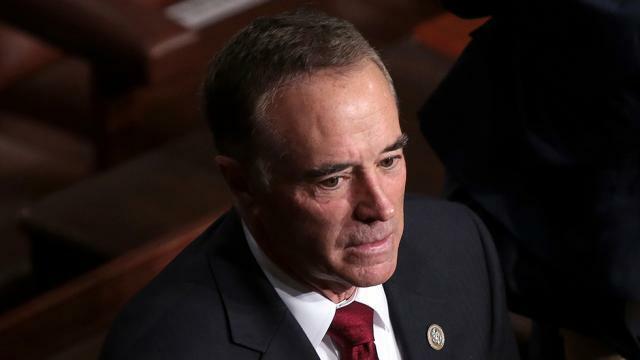 Republican Congressman Chris Collins, representing upstate New York and one of Trump's top defenders on Capitol Hill, surrendered to the FBI on Wednesday morning on securities fraud-related charges, NBC News reported. 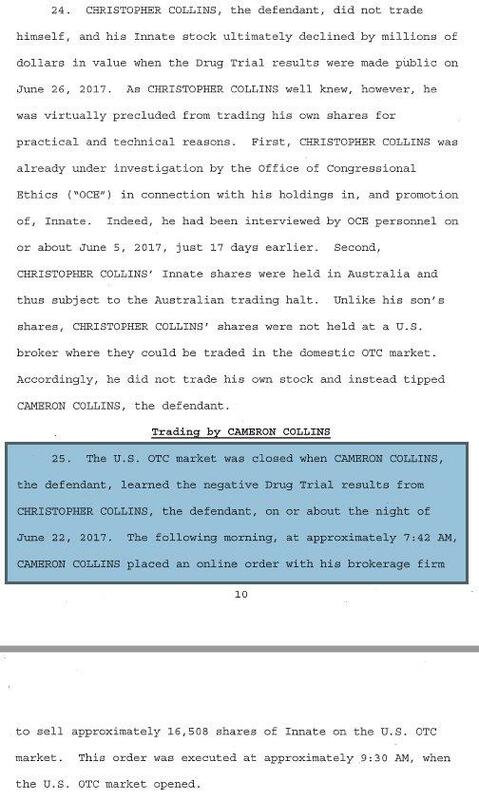 Collins, 68, faces insider trading charges along with his son, Cameron Collins, and Stephen Zarsky, the father of Cameron Collins' fiancée, according to the U.S. Attorney's Office in the Southern District of New York. The U.S. Attorney for the Southern District of New York scheduled a news conference to announce announce the insider trading charges against Collins. Collins, one of Donald Trump's early supporters in his bid for president, is expected to appear in federal court later Wednesday in Manhattan, NBC reported. The three-term incumbent represents New York's 27th Congressional District, which includes suburbs of Buffalo and Rochester, and is up for re-election in November. He has raised more than $1.34 million in his campaign war chest, according to the latest Federal Election Commission filing. 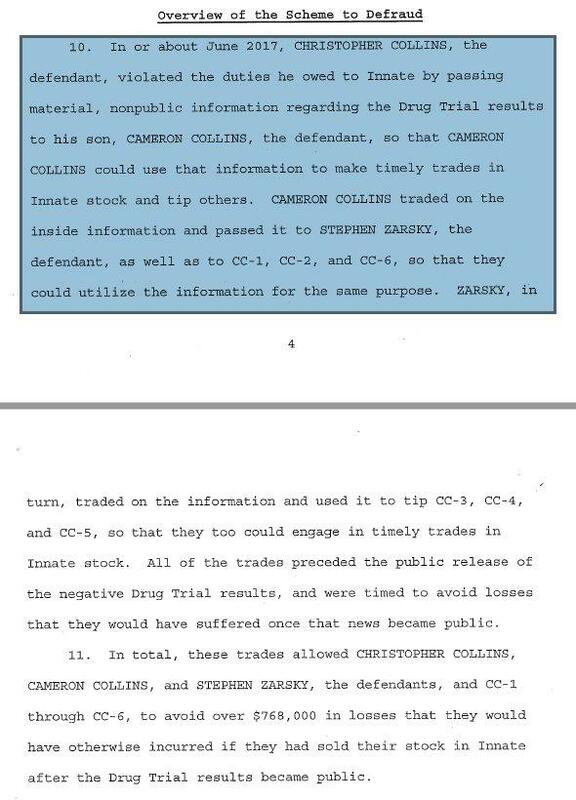 At the crux of the Collinses' alleged scheme is the passing along information about a failed drug trial so the family and in-laws could cut their losses (per Aaron Blake). 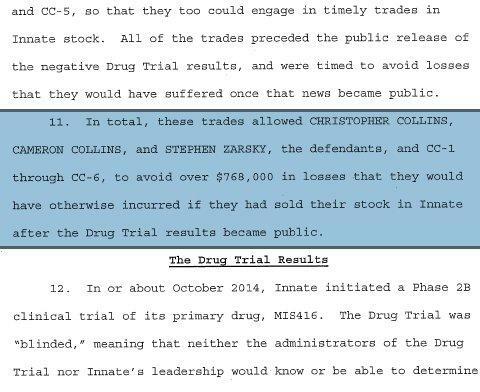 According to the indictment, Collins allegedly tipped off his son, who dropped 1.4 million of his own shares over next few days, right before bad drug trial news became public. And the punchilne: while the alleged scheme only saved its co-conspirators $768,000, Collins, meanwhile, reportedly lost $16.7 million.